Soybean oil consumption has increased rapidly in the United States — but is it good for you? A diet high in soyabean oil can lead to weight gain and diabetes, a new study finds. Soyabean oil may be worse for health than fructose: a sugar used in processed foods, snacks and soft drinks like soda. Over the last four decades soybean oil consumption has increased rapidly in the United States. In the 1960s studies found a link between the risk of cardiovascular disease and the saturated fats found in foods such as dairy products and meat. 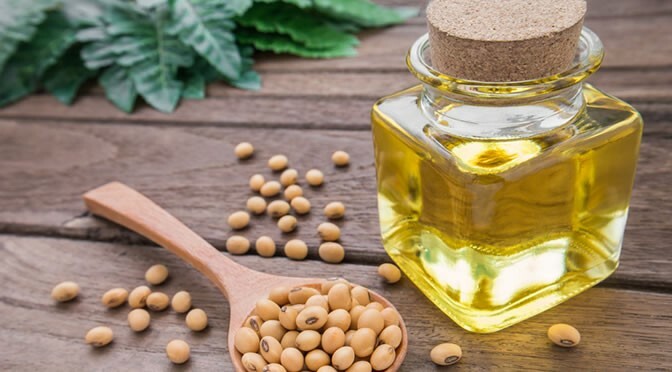 Consequently, nutritional guidelines encouraged people to increase their intake of vegetable oil such as soybean oil and reduce foods rich in saturated fats. This also led to high cultivation of soybeans in the U.S. and so remarkable increases in soybean oil consumption. Margarines, edible oils, salad dressings, snack foods and processed foods are all examples of products high in soybean oil. Now, researchers have examined the effect of soybean oil on health compared to coconut oil and fructose. These scientists fed mice a series of diets containing coconut oil (saturated fat), soybean oil and fructose. In contrast to mice on the coconut diet, mice on the soybean oil diet showed a fatty liver with signs of injury, larger fat deposits, weight gain, insulin resistance and diabetes. The fructose diet had a less severe impact on health compared to soybean oil diet. However, it had a more negative impact on the kidneys and increased the symptoms of inflammatory bowel disease (IBD). This study was published in the journal PLOS ONE (Deol et al., 2015).